I worked with the Environmental Charter School (ECS) to create a tool to facilitate conversation around air quality for school-aged children. I talked to 12 parents and 11 subject-matter experts (in science, education and design) to learn how children learn. We prototyped a game in mobile augmented reality for children to see that they can be builders of a digital, communal forest. The Environmental Charter School in Pittsburgh (ECS), is a public, independent school serving 600 students in the Pittsburgh area. The school began out of a need for eco-literacy and uses a mix of indoor and outdoor curriculum. Pittsburgh is ranked in the top two percent in the United States for cancer risk related to poor air quality. ECS found a wealth of data on the adverse health effects of Pittsburgh air quality publicly available, but no one in Pittsburgh was talking about it. The problem ECS approached us with was this - how do we get our students and parents (to a larger extent, the local community) talking about Pittsburgh air quality? In our client’s words, how do we get to a #metoo movement for air quality and inspire other public schools? Our target audience was school-aged children, so we surveyed 89 parents of school-aged children (ages 6 - 12) to understand what engages children and how they learn best. Our goal was to spark conversation around air quality. What if, instead of telling people that Pittsburgh air quality is poor, we create a game where we assume that to be true, and make the aim to fight air pollution? What if we could create a nudge toward associating green acts with air quality? What if we could bring lightheartedness and optimism to this area? In our research, we found trees to be one of the most cost-effective ways of cleaning air. We also found people to have an emotional connection with trees they plant, even associating them with pets. We imagined a parallel world that is having an air quality crisis. Plumes of dirty air abound. A simple action is possible - you can plant a tree, which will improve the air quality around it. You can see the trees planted by yourself and your peers, and as time goes on, you see the resulting communal forest in digital space (we wanted to also explore this in an augmented reality space, but would need positive feedback to continue). You can see your impact on the in-game air quality meter, but next to it is a real-world air quality meter that is not affected by gameplay. We hoped to spark questions - what if cleaning air in reality was as simple as planting trees? Why isn’t it? What are the opportunities and challenges? 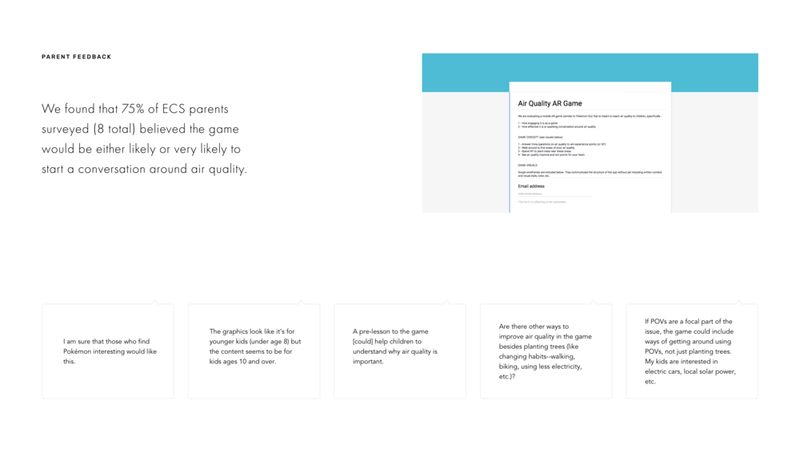 Some of our work involved making the gameplay aspects fun and engaging (being able to customize your own tree, forming teams, etc), but for our clients, fun was secondary in concern to whether the game would teach air quality and bring awareness to the subject. We found that planting 80 adult trees will offset carbon emissions for one adult in the U.S. over the course of a year, and incorporated that into game achievement milestones. To illustrate the AR landscape, I created a prototype overlaying animations on top of AR markers (using After Effects, Unity, Vuforia). Here, you can view trees your team has planted, read detailed information on the tree closest to you (including scientific background), and see other teams’ trees (blue in the gif) appear in real-time. Our client was excited about the designs we presented, noting that games are a great way of sneaking up on education. They encouraged us to explore the educational aspects further - how might we integrate the game more seamlessly into grade school science curricula? We also sought open-ended feedback from ECS parents, making it seem that we were critiquing it from a third-party perspective (instead of having designed it ourselves), and received a wealth of critical, but useful feedback.